Many of the questions you may have about American Wingshooting Lodge are provided here. Please feel free to contact us if you have any questions. We guarantee the opportunity for a limit. Our guides do not carry guns, so we do not know the shooter's abilities to hit. 90% of our groups bag their limit. The limit in South Dakota is 3 roosters pheasants per gun per day. Millions of wild pheasants live in the fields of South Dakota. By taking care of our land, we have no need to stock pheasants. We will be harvesting approximately the same number of birds as we have been in the past years. 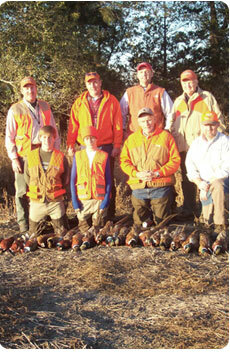 American Wingshooting Lodge's location is consistently at the top of the state's brood count survey. If you're wondering where the most pheasants are, we believe they are right here. Hunting with our experienced dogs is part of our all inclusive hunting packages, but if you wish to bring your dogs that is completely acceptable. We also have kennels available at the lodge for your dogs to use. It is more difficult to maintain safety and prevent hunting in surrounding private land if we do not provide guides. It is possible to drop you in a specific area and let you work your way toward our guides on your own. You can take birds home in a cooler, ship them, or donate them locally. We will help you find a safe way to get your birds home. We recommend that you wear a blaze orange hat or vest for the hunt. It is not illegal to hunt without blaze orange, but for the safety of all hunters we will wear this apparel. American Wingshooting Lodge has blaze orange clothing available if needed. Our guides do not carry guns!